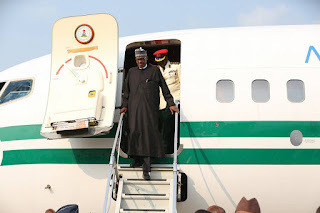 President Muhammadu Buhari has returned to Abuja from N�Djamena, Chad, where he participated in a one-day Extraordinary Session of the Conference of Heads of State and Government of the Community of Sahel-Saharan States (CEN-SAD). Those at the Hassan Djamous International Airport N�Djamena airport to bid the President farewell included Chadian government officials, Nigerian Ministers of Foreign Affairs, Interior and Defence, Mr Jeoffrey Onyaema, retired Gen. Abdulrahman Dambazau and retired Brig.- Gen. Mansur Dan Ali. Others were Maj-Gen. Mohammed Monguno (retd); Director-General, National Intelligence Agency, Amb. Ahmed Rufai Abubakar; Comptroller-General of Immigration, Mohammed Babandede; and the Federal Commissioner for Refugees, Migrants and Internally Displaced Persons, Sadiya Umar Farouq. and the Nigerian Charge d�Affaire, Mr Nasiru Waje. He, however, noted that the �very disturbing recent developments� had impelled the administration to seek support from a wider circle of countries if the illegal inflows are to be curtailed.